At Arlyn Scales, we have been leading the scale industry for the past thirty years. It’s not because we have a magic one size fits all solution. It is because we are constantly learning. We research materials to make a better scale, technological advancements to make more cutting edge electronics, and pursue business opportunities to find new and exciting applications for our scales. Here in Long Island, New York, we create our scales at our state of the art factory. This saves you a large amount of money since we ship factory direct to you, cutting distribution costs. The savings also lets us deliver a high quality scale to you at a cost lower in price than the competition’s lower quality scales at a retail price. We constantly strive to match our scales to our customer’s needs and challenges. Our Model 320-WC is no exception. For doctors and other medical staff, one of the greatest challenges is attempting to record an immobile patient’s weight. 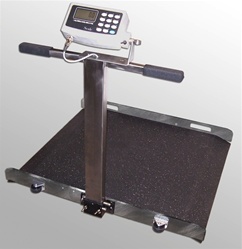 Wheelchair scales help minimize this and provide an easy stress free weighing experience for both patient and clinician. These scales are found in hospitals, doctors offices, nursing homes, and home healthcare environments. When selecting a quality wheelchair scale, there are five characteristics to be mindful of: low profile, ramps, accuracy and ruggedness, scale graphics display, portability. Thanks to specially angled load cells, we are able to create an exceptionally low profile for this scale. This allows the patients to be moved on and off with a minimum amount of discomfort and a maximum amount of ease and efficiency. The platform dimensions are 30Ó x 32Ó giving room to maneuver the wheelchair and patient on the scale. We have also engineered grab bars on to the scale to allow patients a greater sense of security and stability. Patients may also use the grab bars for stand up weighing. The platform is covered with a rubber non slip mat to prevent the wheelchair from accidentally rolling of the scale at any time. With these ramps, you will have greater ability to smoothly move patients on and off the already low profile scale. Often, standalone ramps have a tendency to not fit with a particular scale or their stability is less than desirable. We have made sure these ramps are attached to prevent any problems wheeling a patient on and off the scale. Many manufacturers make their scales out of sheet metal. Not at Arlyn Scales. We manufacture our scale frames out of heavy duty welded aluminum that provides excellent protection against rust and corrosion. We created our wheelchair scale with a capacity of 800 lb. to provide an ample range for weighing. This frame can take the kind of use and weight that a wheelchair scale can expect to encounter on a day to day basis. Our load cells are machined out of stainless steel while most of our competitors use plated steel or aluminum. The stainless steel construction dramatically increases the durability of the scale since the load cells are much more abuse resistant than standard load cell models. This creates even greater accuracy in the scale. The scale also has an automatic calibration feature that prevents drifts in accuracy and keeps precision weight measurements better regulated. Additionally, our scale’s memory has the capacity to store the empty tare weights of standard wheelchair models. This enables the user to quickly select the wheelchair the patient is using. The scale then subtracts the weight of the wheelchair from the total weight resulting in the patient’s weight. During patient weighing, it may be difficult to view the scale indicator’s reading should the display be too small. This can contribute to inaccurate record keeping of a patient’s weight. In turn, this can have severe consequences as medication dosage is calculated by patient weight. We have engineered a display that shows weight results in 1Ó high block graphic digits. This enables the clinician to accurately record weight at a glance and quality wheel the patient off the scale. We constructed the Model 320-WC to be as mobile as possible. Whether you simply need to move the scale to another part of the office to create an easier environment for patient weighing or you are a clinician treating house bound patients, this scale is very portable and easy to use. The scale is constructed with wheels to roll the scale and handles to maintain grip and control while moving it. The scale posts are even engineered to fold down flat. The Model 320-WC also provides some of the best medical records technology on the market. With the scales Bluetooth enabled connectivity, you will be able to transmit patient weight to a health facility’s electronic medical record system. Not only will you eliminate the possibility of misplacing clinical notes, but this feature eliminates human error that can contribute to poor record keeping. Excellent customer support. It’s one of the hallmarks of our firm. Our customers are everything. Without them, we would not have been able to be a leader in our field for the past thirty years. One of the great things about our support staff is they can work with you and your scale requirements. Should our standard wheelchair scale not quite cut the mustard for you because of concerns with platform dimension or capacity, our staff is more than happy to discuss this with you. We will create a tailor made scale for you that meets your practice needs at an affordable price. Our customer service staff is highly trained in all our scales as well as having years of general experience in the scale industry. We recruit staff that is able to talk scales with the best of them. Even if you are not quite sure what scale you need, our staff will be able to point you in the right direction after discussing your weighing needs. Contact us online at http://www.arlynscales.com/CONTACT-US-s/41.htm or call us at 1-800-645-4301. Let us help you get the best scale for your firm.